A few weeks ago I came across this skirt: Inspiration Skirt She does amazing work that looks great and I wish I could afford a $115 skirt, but I can't. So, I set out to see if I could make my own version. First I randomly stumbled across the fabric at Ikea- they also had the blue and green stripe. I bought a yard (which would later cause some issues...I will get to that) and then went home to search my patterns for a pleated skirt. 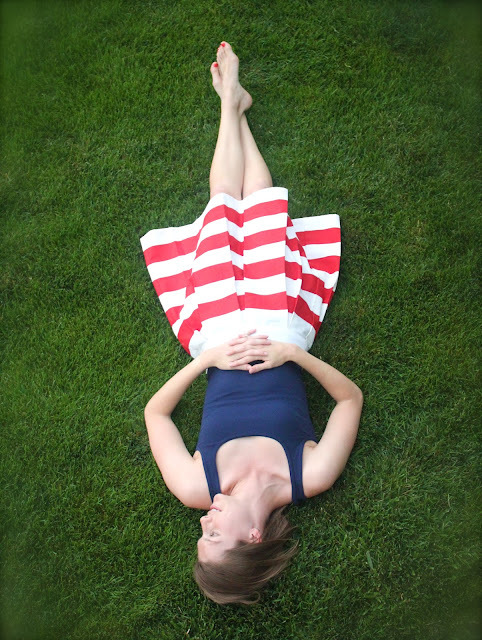 I found a McCalls pattern that I thought would work: 5591 view C. It may have worked out great but when I went to cut it out, the pattern required way more fabric then what I had to create the horizontal stripe. So...I brainstormed a little and thought I could maybe fiddle around with what I had and create a skirt with smaller pleats. I sketched out a pattern using the skirt pattern I had as a guide and here are the steps I followed...there were some bumps along the way, so please read through the entire post to see where you may want to change things if you create the skirt. Also...my advice would be to follow the pattern referenced above if you want all the steps laid out in a professional way and you would like to follow a pattern. Whatever you choose, if you create it, I would love to see it! Good luck. 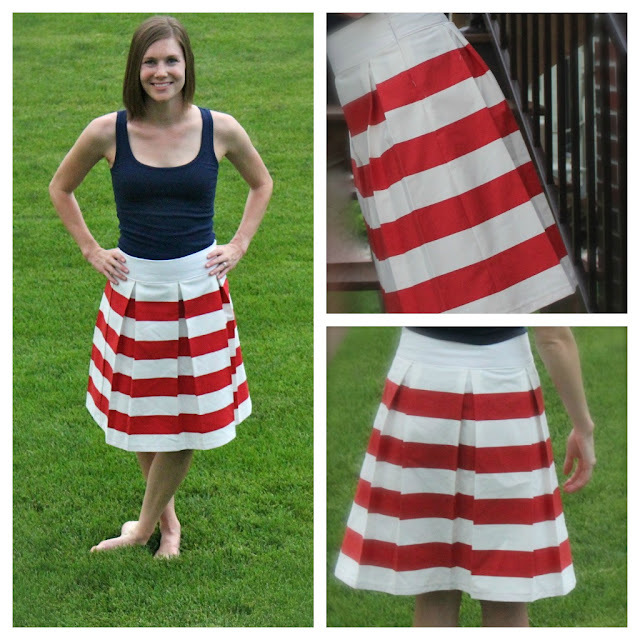 - Cut out a skirt front and back (on the fold) using a pattern you have or trace a similar cut skirt, making sure your stripes are running horizontally. Since my fabric was not wide enough for the deeper pleats I simply lined up the pattern from 5591 with the fabric piece I had and cut out what I could. My skirt piece ended up being approximately a 22 inch by 16 inch rectangle (on the fold...so 22 inches long by 32 inches wide when unfolded). Then I took the waistband from pattern 5591 and cut it out. You could also take a pattern of your choice or trace out a simple rectangular piece for the waistband. **If you use pattern 5591 do NOT make the silly mistake I did. If you notice my waistband is solid fabric- not the stripe. This is because I ran out of fabric from cutting the waistband according to the pattern...which is for a back zip skirt. I wanted a side zip skirt. To get around this problem, simply cut 4 of the "front waistband" pattern pieces on the fold and sew the short ends together to create a waistband. Then repeat with the remaining two pieces and you now have your waistband facing. 4. Baste your pleats in place by stitching 1/4 inch from the top edge over each pleat. Give the pleats a good pressing. 5. Pin ONE side of your skirt front and back together, right sides facing. To help make sure the stripes are lined up, place a pin every time the stripes meet. This will help prevent shifting. Prior to stitching the skirt front and back together I finished off the edges with my serger. 6. Next create the waistband by stitching 2 short sides, right sides together, to create one waistband. Repeat with the other 2 pieces to create the waistband facing. Take one of the waistband pieces and pin it, right sides together, to the top edge of the skirt, lining up side seams and stitch. Then insert your invisible zipper. After the invisible zipper is inserted, stitch the side seam, right sides together, on the zipper side of the skirt from the bottom of the zipper to the bottom edge of the skirt. 7. Fold in 1/4 inch towards the wrong side of the waistband facing and press. Then, pin the waistband facing (using the non-pressed edge) to the top edge of the waistband, right sides together and stitch (sorry no pics of this part). Turn the waistband right sides out and press to create a waistband sandwich...you should have the raw top edge of the skirt in the middle of the sandwich. The 1/4 inch pressed edge will cover it. Pin and make sure your skirt waistband lines up in both front and back along the top edge of the skirt piece. You will now topstitch on the waistband to stitch the waistband "sandwich" together and to create a finished look. I stitch this on the right side of the fabric to insure I am stitching a straight line. Sometimes I miss catching all the fabric on the backside if I wasn't careful when pinning. I go back and hand stitch anything that was left out and I also hand stitch the facing to the zipper. 8. Finally, fold up the desired hem length and stitch the hem. You are done! Press your skirt well and enjoy. Wow! I wish I was more talented in the sewing area! So neat! Thank you Aimee- I am sure you could tackle sewing...hope you give it a try! Super cute! Love the stripes! I'm your newest follower! This skirt is super cute. I pinned it to pinterest and will be making it as soon as I get out of these maternity clothes! Thanks for sharing. What a darling skirt!! I love those wide stripes with the pleats! It turned out great! I knew the skirt you were referencing the minute I opened this post...I love it! Your version looks amazing! Kudos! !